Quantum Chess, a variant of the chess game invented by Selim Akl, uses the weird properties of quantum physics. Unlike the chess pieces of the conventional game, where a pawn is a pawn, and a rook is a rook, a quantum chess piece is a superposition of “states”, each state representing a different conventional piece. In Quantum Chess, a player does not know the identity of a piece (that is, whether it is a pawn, a rook, a bishop, and so on) until the piece is selected for a move. Once a piece is selected it elects to behave as one of its constituent conventional pieces, but soon recovers its quantum state and returns to being a superposition of two or more pieces. Why Quantum Chess? Conventional chess is a game of complete information, and thanks to their raw power and clever algorithms, computers reign supreme when pitted against human players. The idea behind Quantum Chess is to introduce an element of unpredictability into chess, and thereby place the computer and the human on a more equal footing. Loka is a 4-player chess variant that had a successful Kickstarter campaign last year. 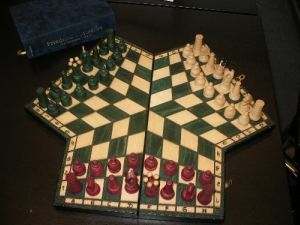 The game features both a fantasy-styled chess set that can be used for traditional chess, as well as a variant rule system built around a point-based army building system, and dice for resolving captures. he only difference with the rules of orthodox chess, is that pawns may also promote on the sixth and seventh rank. When a player moves a pawn to the sixth rank, it may choose to promote the pawn, or may decide to keep the pawn as a pawn. (Usually, one would choose the first option, but one might for instance want to avoid stalemate, or leave the option to take a knight open.) When the pawn remains a pawn, the same choice is there again when the pawn is moved to the seventh rank. When a pawn is moved to the eighth rank, it must be promoted. 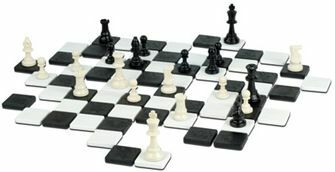 Beyond Chess is yet another chess variant with a twist — the chess board is composed of tiles that players move during the game. The game has received generally good reviews, but it is pricey at almost $40. If you’re curious, there is also a free online version of Beyond Chess. I have no idea how it’s played, but MeIgnorant has some interesting shots of a three-player chess variant. Hmm…now the next time my wife gives me a strange look after I ask her if she wants to join me in a three-way, I can act all indignant and insist I was only talking about chess.